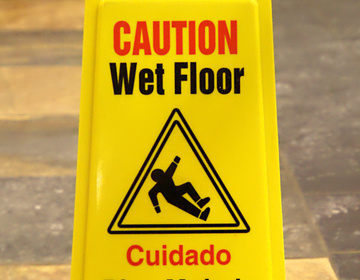 When is NOTICE Sufficient to Hold a Landowner Liable in a Slip & Fall? The business owner owes a duty to keep the premises in a reasonably safe condition for use. If the business owner or one of its agents is responsible for the for the foreign substance--they will be liable--because a foreign substance is not consistent with an ordinary standard of care. If someone else (other than the business or its employees) caused the substance to be on the floor -- the business is liable only if they had “actual or constructive notice of the condition and failed to remedy it.” Id. at 322-323. A common example of where a business would be responsible under Sprague would be when an employee mopped the floors of a restaurant and left a pool of water on the floor, causing an unsuspecting patron to slip and injure themselves. The question of liability becomes a little more complicated, however, when we are dealing with the issue of notice. The distinction between actual and constructive notice in the legal realm is crucial. Actual notice means that the property or business owner was “actually” aware of the dangerous or hazardous condition, whereas, constructive notice must be derived from the facts and circumstances to show that the business or property owner should have known of the condition. Example: A shopper spills a drink on the floor in one of isles at a grocery store. She doesn’t alert any employees of the spill and just keeps walking. Moments after the spill, you turn the corner down the same isle and slip on spilled drink. Under these facts, the store would not have actual notice. Whether or not the grocery store has constructive notice, however, is a question of fact to be determined by the jury. What Qualifies as Constructive Notice? According to the Nevada courts, constructive notice exists when a “reasonable jury could determine that based on the circumstances of the hazard the defendant should have known the condition existed.” Fowler v. Wal-Mart Stores, Inc., Dist. Court, D. Nevada 2017. This means that a Plaintiff, if he can’t prove actual notice, must provide evidence to demonstrate negligence on the part of the property owner, i.e., that the owner should have or could have prevented the injury. How would he do this? Show that the substance was on the floor for an unreasonable amount of time. Show that a reasonable inspection would have revealed the condition. When it comes to the issue of time, what constitutes an “unreasonable amount of time”? Until very recently, this was a question that frustrated many lawyers, plaintiffs and defendants. Fortunately on August 30, 2018, in Wynn Las Vegas, LLC v. O'Connell, the appellate court upheld a ruling which allowed an injured Plaintiff to successfully recover against the defendant, Wynn, without actually demonstrating that the substance was on the floor for any specific length of time. Ultimately, it is a fact driven analysis and the nature of the circumstances surrounding the fall are going to be crucial for showing that the landowner was at fault. The good news for Plaintiffs, as it would seem, is that they don’t necessarily need to show the substance was on the floor for any specific length of time. When Won't I Have to Show Constructive Notice? There are some circumstances where a Plaintiff would not need to prove the landowner has actual or constructive notice. This would be the case where an injury was brought on by the “mode of operation” or “recurrent risk.” Under this legal theory, a Plaintiff is not required to prove the defendant “had knowledge of a particular hazardous condition if the Plaintiff can prove that the nature of the defendant’s business tends to create a substantial risk of the type of harm the plaintiff suffered.” FGA, INC. v. Giglio, 278 P. 3d 490 - Nev: Supreme Court 2012. Essentially, if the Plaintiff can show that the nature of the business, itself, creates the risk for the injury the Plaintiff suffered, then she would not need to prove there was constructive notice. Example: At a self-serve frozen yogurt shop, customers often overfill their cups and frozen yogurt drips and accumulates on the floor. If you slipped on the frozen yogurt and injured yourself, you would be able to argue that the self-service yogurt operation is what created the risk for the harm you suffered. Therefore, the judge would instruct the jury to evaluate the facts and consider the mode of operation as a theory for proving the yogurt shop owners negligence. The mode of operation approach applies in the context of “self-service,” where business owners have elected to allow patrons to serve themselves. In FGA, INC. v. Giglio, the NV Supreme Court has held definitively, that this theory would not extend to sit-down restaurants.